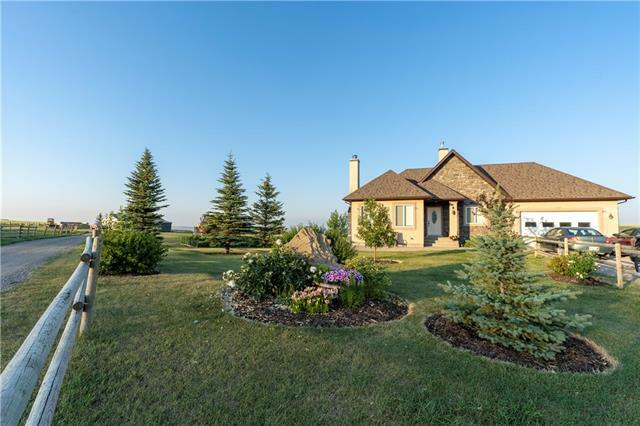 "Spectacular Equestrian Property conveniently located in the rolling pastures just 15 min to Okotoks. This horse haven comes with an Intensive Ag permit for 34 horses, a newer 80 x 180 radiant heated indoor arena with GGT footing, outdoor 125 x 250 ring, the 16- 12 x 12 stalls in the heated barn have soft stalls and auto water, 2 tack rooms, wash rack, wash room/laundry room, client lockers, blanket & feed sheds, 5 day pens, 4 paddocks and 5 pastures and 35 acres in hay. The barn and arena are set up with an extensive Air Exchange system keeping them warm and condensation free in the winter and cool in the summer. A complete renovation to the walk out bungalow which features over 1800 sq ft total developed space. The kitchen features high end appliances, granite and full height custom cabinets. The workshop is heated with 220V for the ultimate man cave. The beautiful landscaping features raised beds, firepit ,over 100 trees all overlooking the rolling pastoral land. Super set up that is ready to go."